The Keeva Body Wash with Argan, Tea Tree, and Coconut Oils feels like a treat on your skin. My body is not only clean but it isn't left dry. My skin feels awesome and I have only used it a few times so far. I love that this has a pump so that I can dispense it easily onto my pouf while take a shower or bath. This also keeps my children from using excess amounts. Believe me they can go through a whole bottle in under a week but put a pump on it and magically it lasts longer which save me money. I look forward to trying other products from Keeva in the future. The Keeva Organics Body wash can be found on Amazon. What Keeva Organics has to say about their product. Don't you hate parabens and body wash products that are full of poisonous chemicals? We all know that these chemicals are harmful and are terribly unhealthy. Did you know that your skin is your largest organ? You should be able to eat whatever you put on your skin. Think about it. In fact, you should literally throw out any shampoo, body wash, or conditioner that isn't 100% organic right now because they're doing your body more harm than good. Our goal at Keeva is to provide you the same quality of $80 high end organic body wash products for a fraction of the price. 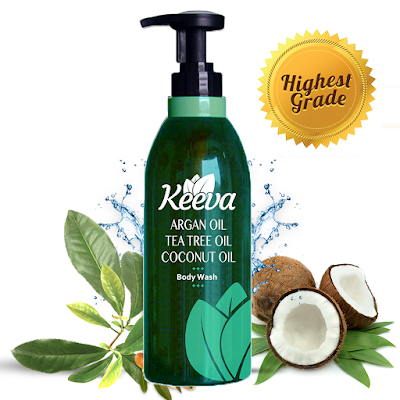 Why Keeva is Made with Essential Oils: Tea Tree Oil, Argan Oil and Coconut Oil are the ultimate combination of the top 3 most popular essential oils for healthy skin and skin. This potent combo of organic ingredients will revitalize and invigorate your skin with natural ingredients and will make your skin as smooth and healthy as possible. Keeva's proven formula aids by hydrating and restoring the moisture levels of your skin. It also repairs damage from any excessive styling or chemicals from other products and helps with anti dandruff. Tea Tree oil has been used for thousands of years by the Chinese as an antibacterial remedy that cleans deep into your pores. Argan oil makes your skin grow better with vitamin E and other nutrients from the Moroccan argan tree. Coconut oil has fatty acids that protect your skin and act as the perfect moisturizer. Thus, you get cleansing, growth, healing, and moisture all in one with no parabens or sulfates. Disclosure: MarksvilleandMe received one or more of the products mentioned above as part of a promotion with Tomoson and Keeva Organics. Regardless, MarksvilleandMe only recommends products or services we use personally and believe will be good for our readers. Some of the links in the article may be “affiliate links.” This means if you click on the link and purchase the item, I will receive compensation. If you would like MarksvilleandMe to review a product or service please contact us at marksvilleandme@gmail.com.